I’m not really sure what’s going on right now. The Lady is frantically running around trying to catch me in the field. It must be a game. I think I’m winning. She keeps telling me that if I don’t stop running around she’s going to feed me to the sharks. What is a shark and why would they want to eat me? 12:45 pm. The Lady won the game and tricked me around the tree so I am now loaded on the trailer and going somewhere. She didn’t tell me where. 12:55 pm. The Lady brought me to her house! I know it’s her house because I’ve been here many times. She lets me eat grass in the field out back. Why isn’t she letting me out of the trailer and why is she yelling at the tall skinny man that comes with her sometimes? And what is that sweet smell coming from the white truck? 1:15 pm. Okay, we’re on the move again and I didn’t get to go out in that field and eat any grass. At least I know where I’m going now. The Lady told that tall skinny man that she was very very late to be at The Muckleratz Ride. 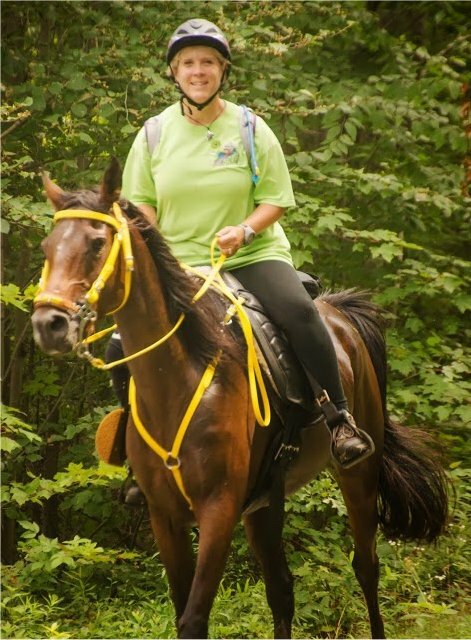 I remember her telling me when we were working on trail that I was going to be at the Muckleratz Ride but that someone else would be riding me because her back still hurts a lot. I tried to tell her that I would take it easy and she would be fine, just like when we ride on the trails, but she doesn’t listen to me. And I can still smell that sweet smell. It’s coming into the trailer and making me sneeze. 2:55 pm. OH MY GOSH!!!! The Lady is on fire. There is smoke all over her. WAIT! It’s not The Lady on fire, it’s the white truck. And it doesn’t smell like fire, although it looks like fire. It’s that sweet smell, really strong. It makes me sneeze. The Lady has pulled off the road, gotten out of the white truck and is talking on the phone to someone. The Lady sounds sad. I don’t like when The Lady is sad. If she would let me out, I could make her smile by doing something totally silly. That always works. 4:00 pm. Uh oh, The lady has disconnected the trailer from the white truck. I’m gonna die, I have no truck attached to my trailer. It’s gonna end badly … oh, WAIT. Who is this man hooking his truck up to my trailer? I don’t know, but he makes The lady smile and laugh so that is good. She’s been sad for too long standing on the side of the road. 4:20 pm. Hey, I just met my rider for tomorrow, LeeAnn. She told me that The Lady is having some trouble with her truck and I was supposed to do what LeeAnn asks me to do. She’s a nice person, she set up my corral and gave me hay and water. I didn’t have any hay in the trailer because The Lady did not think I would be in there very long. LeeAnn petted me and told me I was pretty. 6:30 pm. LeeAnn is back and she gave me my favorite part of supper. ENDURANCE SLURPY. I love my slurpy food. I only get it at the competitions. I wonder if we’re getting ready to go on a ride now? But where’s The Lady? I am looking and looking for her and I’ve called for her a hundred times. Oh, let me eat this slurpy and think about that. 8:30 pm. I HEAR THE BLACK TRUCK and I start hollering and hollering. I know it’s The Lady. I’m so glad she’s here. I hope she can hear me hollering and hollering. 9:15 pm. She’s here! She hugged me and hugged me. I rubbed my head up and down her belly. It’s good to see The Lady. She said she had to visit with the riders while her friend Cate gave a ride briefing. She told me that I was going to have a lot of fun tomorrow because the trail is great. What’s a Ride Briefing? 10:05 pm. Look here! The Lady is sleeping in my trailer and I can stick my head in the window and puff air on her head. How cool is that? Oops, I must have puffed too much air because she closed the window cage and now I can just look in and see her. I wake up The Lady and tell her I’m starving and there is a ride going to happen soon. She gets ups and give me A SLURPY! I love my slurpy. She gives me some hay and then brushes me. All of a sudden, some loud speaker starts blaring music. WOW, how cool is that? The Lady tells me that all the horses will be waking up now so I need to stay calm and relaxed. WHAT? Is she kidding me? I never get wound up about anything. Ever! How cool is this? Here comes LeeAnn. The Lady has disappeared doing secretary stuff for the ride (what is a secretary?) and LeeAnn brushes me again (love the brushing!) and puts on some fly spray (sigh, good stuff) and tells me all about the ride we’re going to do. YEA! She gets my girth from The Lady’s saddle and saddles me up. Oh, my pretty yellow bridle, too. 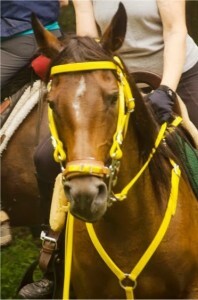 I’m glad because I really like my pretty yellow bridle. She took off the bells? Hey, LeeAnn? I really like my bells, can we have them back on? Pretty please? (drat) She said “No bells, it will scare her riding partner.” Bah humbug, I like my bells and I always tell The Lady how much I appreciate them because when my gear comes out and I hear the bells, I perk up and get all excited to go for a ride. No-one else has bells on their gear, just me!!! Because I am special!!! Hey, here comes that black mare again. I recognize her voice! She lives across the road from me at my home. How nice to see her here at this ride. Even if she does make faces at me. LeeAnn walks me around some and then we get to go by the blue truck that has the speakers in it. I perk up my ears to hear that music again but it’s not playing. And we’re off down the trail. I love this part! My tail is up, my ears are forward and I’m doing my Happy Arab trot. LeeAnn doesn’t seem to mind my Happy Arab trot. Everytime I do this trot, The Lady giggles … then she tells me to stop before I bounce her out of the saddle. I get to ride behind and let the other two horses find all the spider webs. How cool is that? LeeAnn seems to like me, she’s relaxed her hands and is letting the reins droop just like The Lady does when we ride. I take care of LeeAnn, letting her know when the trail is too rocky and we need to slow down and when the steep part comes, I carefully choose my footing on the way down so LeeAnn doesn’t fall off. She pats me a lot and tells me what a good girl I am. Oh, the ride was over too fast. Here we are back at the camp again. Ahhhh, I see … we’re doing that HOLD thing. I’m getting rinsed off (that feels nice) and then I get to have my pulse taken and do my pretty Arab trot for the vet. Did I do good? Did I? I see The Lady watching me and she’s smiling, so I must have done good. Whee, LeeAnn is back on and we’re going on the trail again. I heard her talking about snakes. I don’t like snakes. I killed one at the barn a month ago. Stomped and stomped on it and The Lady thought I was a hero. What’s a Hero? I have good rhythm this loop. I drinks at all the water stops and eat grass and do everything The Lady taught me to do when I’m working hard. LeeAnn still likes me because she tells me how good I am. The trail is very nice to work on and we stop before we get to the base camp and we pig out on grass. For a very long time. I am getting a little antsy to get back and show The Lady how well I did but LeeAnn says it’s not time to go yet. Okay, I’ll eat more grass. When we come in, The Lady isn’t there to greet me. I look everywhere but she must be off doing more secretary stuff. No-one has explained that to me yet. Everything at the final vet check is great. I know because LeeAnn is grinning ear to ear and telling me how wonderful I am. That makes me happy. When we went back to the vet check and got the Hands-On, LeeAnn said I was perfectly wonderful. Yea!!! I like being perfect. I am an Arabian, you know. The Lady comes to see me and tells me that I got 5th place with a score of 97.5. She gives me hugs and then breaks out my favorite cookies and gives me five. She never gives me more than two, so I know she is very happy. She gives me more hay and while I’m showing down, she brushes me all over and checks my feet and my legs and even sticks her fingers in my mouth. I don’t like that so much, but then she gave me a peppermint, so that made up for it. She goes away again and I decide I need to rest a while so I snooze under the tree in the shade. Thank you, LeeAnn, for setting up my corral under the tree. A nice lady named Priscilla comes to visit me in the late afternoon. She takes me out to stretch my legs and eat some grass. I like this person, she’s very quiet and not fussy. I eat grass and meet her friend’s horse. He’s a nice looking gelding with very long legs. I sure hope I can keep up with him tomorrow. I don’t have long legs but I can sure stretch my legs out and go fast!!!! DARK and it’s time for bed. It’s been trying to rain a couple times since I got back from my ride. The Lady asked me if I wanted her to put up the canopy and I told her that I had a nice tree and didn’t need it. She was glad because she really didn’t want to drag it out and set it up. I think The Lady was only in bed about 30 minutes when a big thunderstorm came. She quick ran out of the trailer to check on me. I told her to go away, I was sleeping and didn’t need her to fuss over me. I sleep out in thunderstorms all the time at home. The Lady comes out of the trailer and gets me all brushed and fed. SLURPY TIME! I love my slurpy. She tells me that today I am going to do the same trail but with a different rider. Priscilla is going to ride me today. I liked Priscilla, it will be a good ride. Day 2 of the Muckleratz July 2013 CTR. I am still working hard! Priscilla is a little more nervous about the ride than LeeAnn was … she’s fussing over me too much. I don’t like to be fussed over. It’s annoying. The Lady came over to help her get the girth just right. And Priscilla relaxed after The Lady came over to help out. I like Priscilla riding me. She only weighs about three pounds. It’s like she’s not even on my back. Her saddle is a little hard. It has a tree in it and The Lady’s saddle doesn’t have a tree. The Lady’s saddle is very soft and moves with me when I ride. I stiffen up a little under Priscilla’s saddle, but I’ll be okay. It’s not pinching me or anything….just hard. Here we go! I’m hoping I can keep up with this Morgan horse. His legs are REALLY long. About two miles into the trail I decide he’s lazy and not moving fast enough so I go out front. I lead the whole way. Ha! See, I may be short but I have speed! Priscilla tells me I am a very mannerly and good girl because I listen to her and I don’t go too fast. Back into the base and THERE’S THE LADY! I call and call to her until she comes over and helps Priscilla cool me off for the pulse check. WAIT! Lady, come back. I get a little agisted when The Lady walks away to help someone with secretary stuff and my heart rate goes up again. It’s okay, under the required 64, but not its usual low rate. The Lady comes back and I settle back down again. Priscilla gets back on and we’re off to so the second loop. The Lady thinks I’m tired but I’m not. I trot out front and lead the whole way again. In fact, I am so happy, that comeing back into base camp I am still trotting with my tail up and my ears forward. The Lady sees me and calls my name! She loves me. The Lady helps Priscilla cool me off and my pulse is perfect at the 20 minute check. My trot out is perfect, too. I know because I heard The Lady telling Priscilla that I looked relaxed and happy with my tail up and my ears forward. When I go back up for hands on, the judge found a saddle sore (told you I didn’t like that treed saddle) and I was a little tender on my back hind tendons. Hey! I just competed two days in a row with two riders I never met before … if that’s all they could find, then I am a remarkable horse. AND!!! This is only my third and fourth competitions. I now officially have 100 ECTRA miles. Isn’t that way cool? The Lady had already broke down the camp and my corral is gone. She did park the trailer under a tree and guess what’s waiting there for me? MY SLURPY!!!! I love my slurpy. I wish it could be a competition every day so I could have a slurpy. I decide to take a nap while The Lady was off doing secretary stuff. Later, The Lady woke me up to tell me that I completed the ride in 9th place with a score of 97.5. She is very very pleased with my riding this weekend and she hugs me a million times and gives me five more cookies. WOW, I got ten cookies in two days. That is a remarkable weekend for me! I never get so many cookies! The Lady now has the black truck and we make it home with no troubles at all. I had a lot of fun and I spent all evening telling Praire and Dalliah all about my ride adventures.